Get drunk much?! Make sure you don't wake up in a ditch!!! 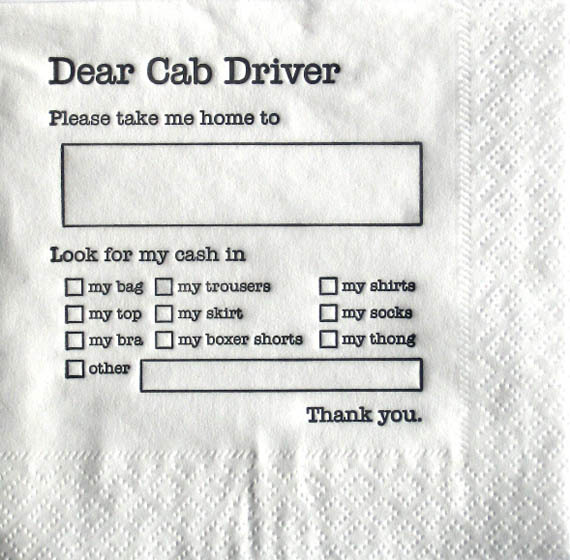 Let your cab driver know where to drop you off and ofcourse where to find your money! Wowwww! Wonder what inspired this creation! Wouldn't exactly want a taxi driver looking for money in my thong! But hey! Could be interesting! Ingenious, will create a batch of my own forms. Aways troubled when giving drunken directions.